Robert Rodriguez Jr is a landscape photographer, teacher, and author focused on conveying the beauty and presence he experiences in nature. Picking a favorite photograph is like selecting a favorite song, an impossible task if both photography and music have been significant parts of your life. They certainly have been for me. I've been fortunate to enjoy a career in both, and the older I get the more I appreciate how interconnected they are. Music can often generate visual imagery, either from memories, significant experiences, or associations we make subconsciously. I remember listening to an old song recently by one of my favorite bands. I was instantly transported to my bedroom where as a teenager I practiced playing the bass for hours every night, trying to recreate every sound I heard on my well-worn cassette tapes. 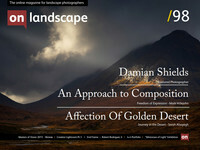 When I transitioned to landscape photography, I applied the same approach to learning this new medium. I tried to make images that looked similar to the images that captured my imagination. I knew that if I repeated the same process, I could learn to “copy” images from a technical perspective. But that wasn’t enough, it was just a starting point. What I really wanted was to share how I felt inside. Interpreting the landscape became my primary focus and greatest challenge, and still struggle with today. My experience in music had taught me that what made a musical performance special, what gave it soul, was the musicians own emotional investment in his art and craft. It was the meaning behind the music, the purpose for making the music that made the biggest difference. And that’s more important today than ever given the advancement of technology in photography. Infusing “meaning” in a photograph is still something that technology can not do; that is still the sole domain of the photographer. I realized that landscape photography could also have soul, and elicit deep feelings inside. As I browsed image after image of similar subject matter or locations, I began to notice the images that were soulful to me and why. Most images were descriptive, but every once in a while there was an image where the subject matter faded into the distance, and what remained was an emotional energy that held my complete attention—it resonated inside. One image in particular that had a big influence on me was “Evening Tidal Pool“ by David Muench. Here was a picture that was visual and musical, something I had never experienced before. It captured the landscape in a way that was both literal and metaphorical, containing melody, harmony, rhythm; many of the qualities that make music such a powerful medium. The realization that there was a connection between the two, and that both could elicit the same emotions was exciting and profound.